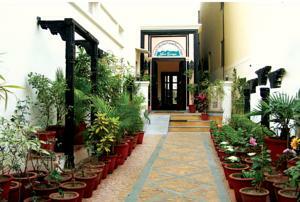 In a heritage building, Haveli Hari Ganga offers boutique accommodations with private balconies. Boasting a rooftop cafe with scenic views, it features a spa, steam baths and meditation rooms. Featuring carved wood furnishings, air conditioned rooms are decorated with Indian fabrics and warm colors. A TV, tea/coffee making amenities and heated showers are available. Guests can enjoy relaxing massages or practice yoga. The staff can help with travel arrangements and laundry needs. Akshay Pattra offers Asian, Indian and international vegetarian dishes served at the rooftop. Room service is also available. Haveli Hari Ganga is 4 miles from the historic Chandi Devi Temple. 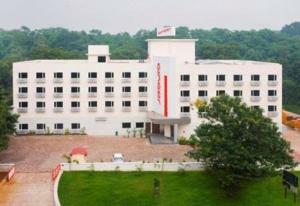 It is 32 miles from Dehradun Domestic Airport and offers free parking. The hotel also offers free train station transportation via private rickshaws. Free! All children under 5 years stay free of charge when using existing beds. One older child or adult is charged INR 1000 per person per night in an extra bed. The maximum number of extra beds in a room is 1. There is baby beds in a room is 0 capacity for cots in the room. Any type of extra bed or crib is upon request and needs to be confirmed by management. Supplements are not calculated automatically in the total costs and will have to be paid for separately when checking out.